Love Almond Roca but don’t love the price tag? Well, it’s your lucky day! Now you can make amazing homemade Almond Roca Recipe. 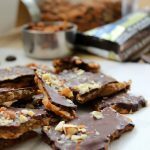 This delicious almond roca recipe came from Tam and C from FoodApparel.com. It is a delicious holiday treat and makes a great edible gift. That is if you can keep from eating all of it before you give it away. And you just need five ingredients: butter, sugar, corn syrup, almonds, and chocolate. It’s made on the cheap, but tastes like the real deal! Now perhaps candy making sounds intimidating to you. You’ve heard many a story of a crystallized mess of sugar and burnt pan bottoms. But have no fear. We’re including some tips and tricks (and pictures) to help you come out with the perfect batch! And also, this can just be a great excuse to “practice” a few times to make sure you get it down. 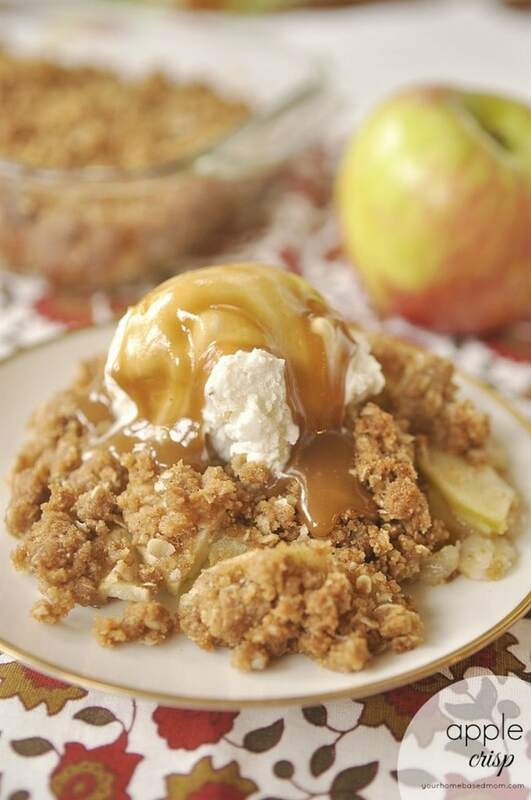 The hardest part about this recipe is knowing when to get the mixture out of the pan! You have to get it out quickly onto the sheet pan and spread out without scraping the pan. It’s absolutely crucial that you have a candy thermometer! Once it hits the perfect temperature, you need to jump into action. Use a “heavy metal” pan. Non-stick doesn’t work for candy making. Heavier pots promote more uniform heat distribution and help prevent burning. We also recommend a wooden spoon. Having the butter in with the sugar from the get-go helps tremendously with preventing crystallization. 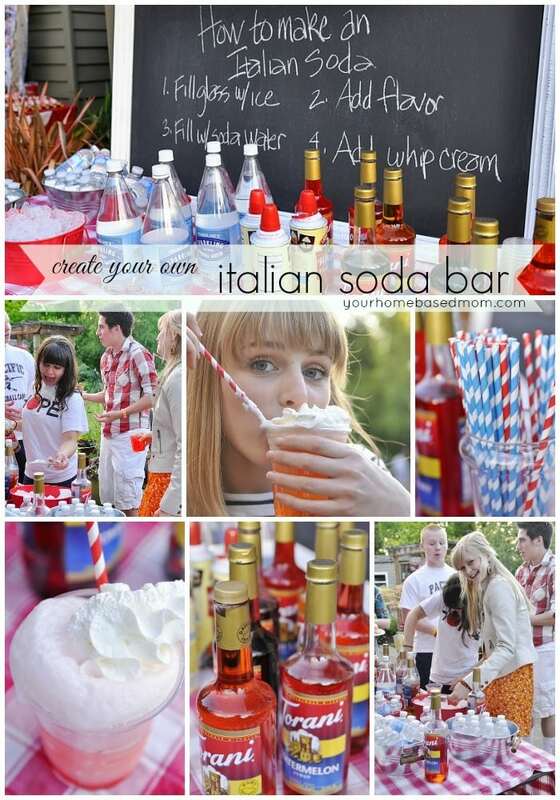 However, we do recommend using just a little bit of corn syrup (which is an invert sugar) that also aids with this. Another tip to avoid crystallization or weird texture issues is that when stirring, use a figure eight pattern to simply swirl everything around. DO NOT SCRAPE SIDES OR BOTTOM OF PAN. There will be a couple ooey gooey sticky and perhaps burnt caramely spots in the pan when you’re done and that’s okay. You just don’t want that getting in the roca. Have your greased cookie sheet and spreading tools ready in advance. You want to be 100% prepared when the candy hits the right temperature. Firsty you take it off the heat and add the chopped almonds. Then quickly spread it on the greased cookie sheet. 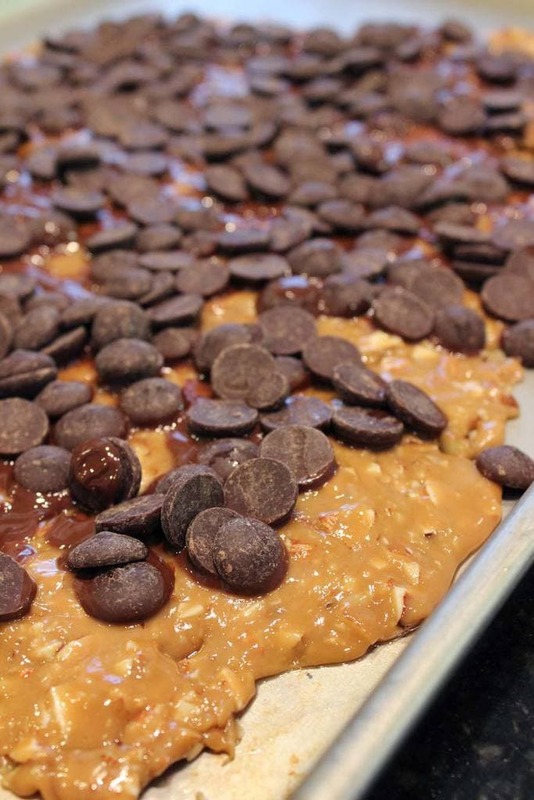 Top the hot almond toffee with chocolate chips. The heat from the toffee will melt the chocolate. 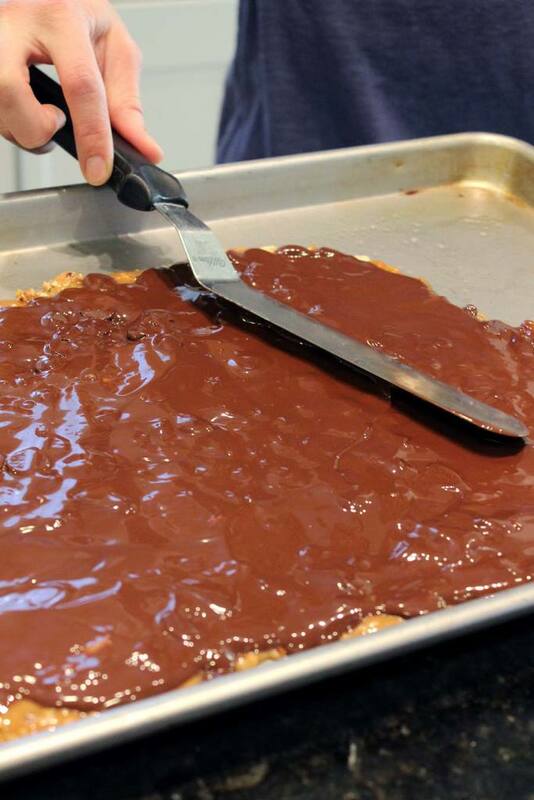 Then before the chocolate cools, spread it over the toffee. And top with more chopped almonds. Then let it cool completely. Break into pieces and enjoy! 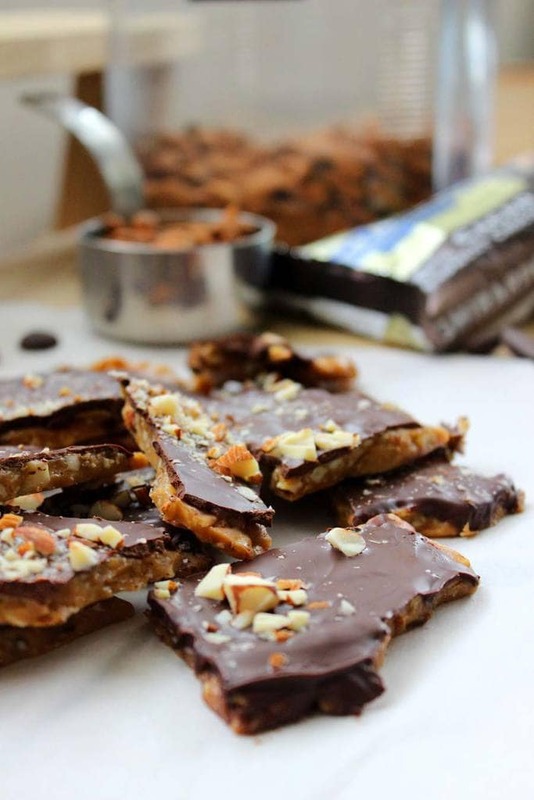 Delicious homemade chocolate almond toffee. Tastes just like the expensive store bought version! Grease or oil a large rimmed baking sheet. Set aside. Once the sugar is dissolved and butter melted, turn the heat up to medium and stir gently as the mixture comes to a boil. Again, this may take a few minutes. Once it comes to a boil, clip a candy thermometer to the side of the pan and continue stirring gently as it cooks. During this time you want to stir the mixture gently back and forth (like a figure eight). 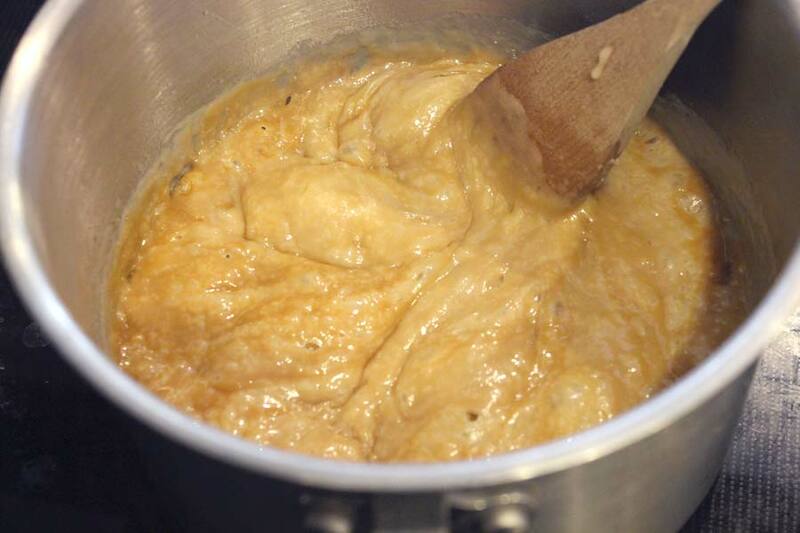 The mixture will gradually get darker until it reaches 300 degrees F (in the hard crack stage). Once the mixture hits 300 degrees F, Immediately take it off the stove and stir in the finely chopped almonds. 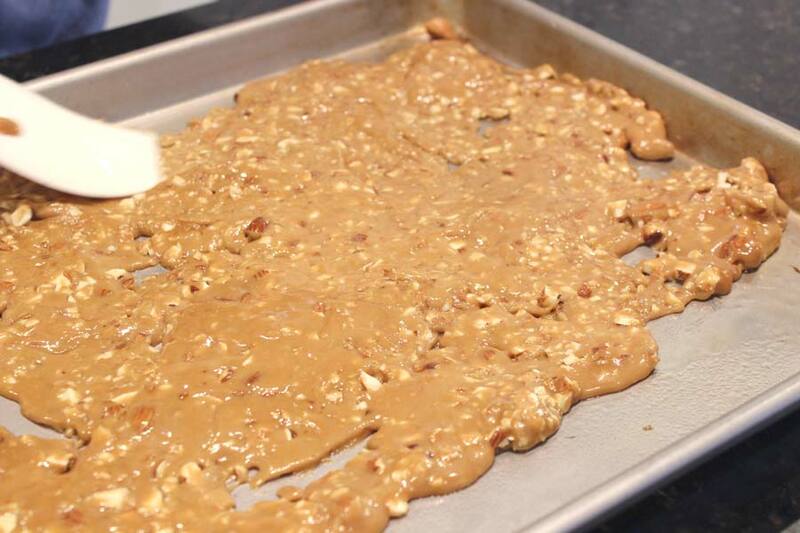 Pour the candy onto the prepared baking sheet, taking care not to scrape the bottom of the pot as you pour it out. 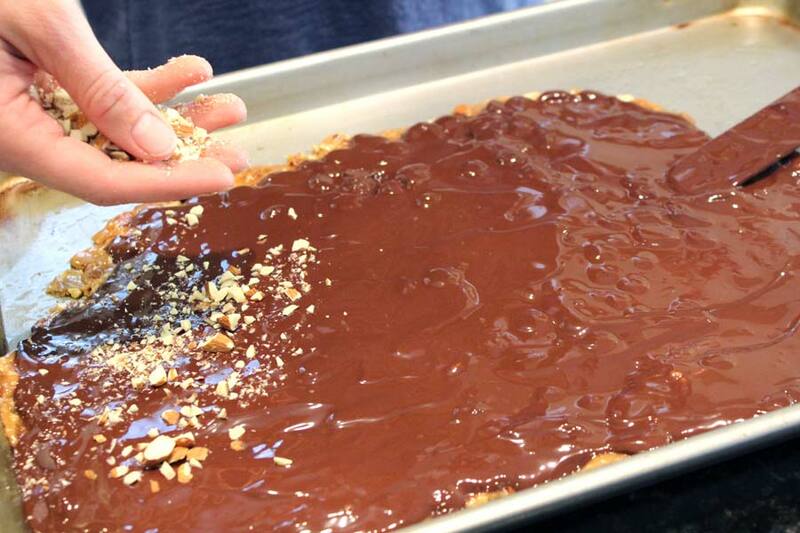 Quickly spread the toffee into an even layer on the baking sheet using your spatula (or an offset spatula) – it will cool quickly which then makes it hard to spread. Spread chocolate evenly and top with extra chopped almonds if desired. Leigh Anne, thanks again for having us over here! We are happy to share. 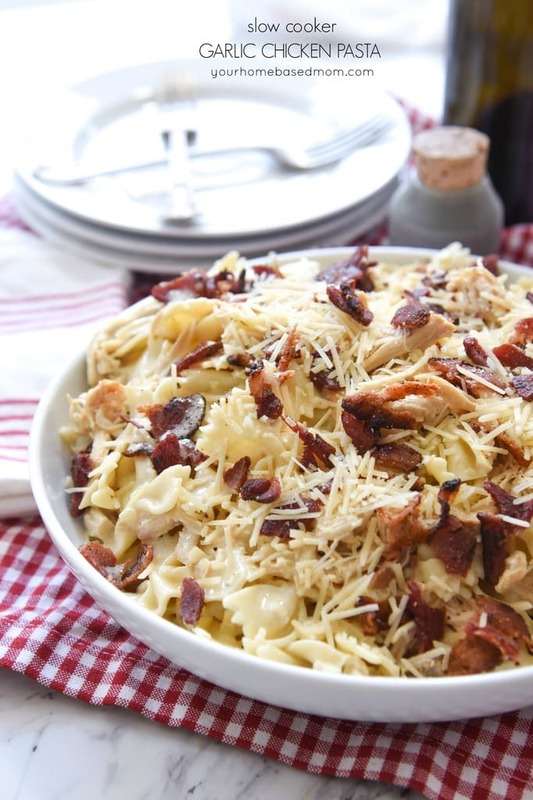 And if anyone else has questions about this recipe, feel free to comment here and we will gladly answer. 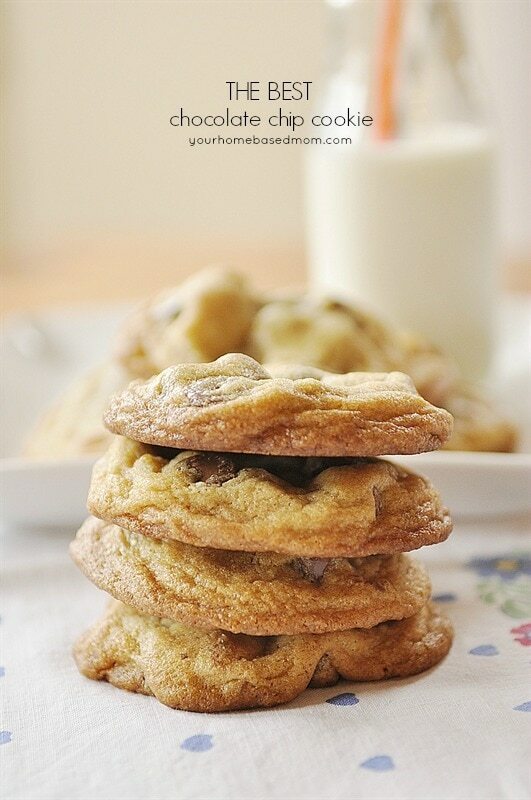 Thanks so much for sharing this yummy recipe as part of Bake Craft Sew! This would make the perfect homemade gift for the holidays, thanks for sharing! 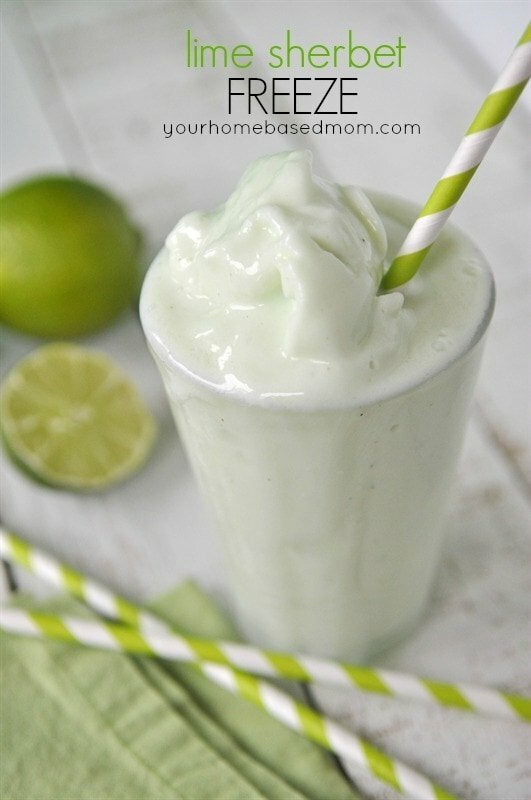 It would be perfect and delicious! I might have a hard time giving it away. I have been making this recipe for over 40 years, but discovered by mistake that it won’t work with unsalted butter. Do you really make yours successfully with that? Apryl, This recipe was made successfully as written. My favorite combination is sweet and salty! 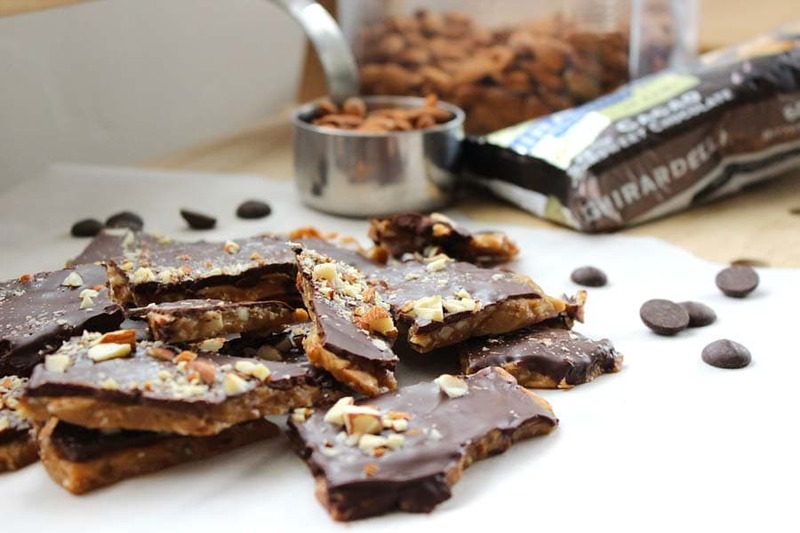 This brittle looks so yummy!